FM 170 is one of the most scenic drives in Texas. This winding, twisting, turning road runs through Big Bend Ranch State Park from Presidio to Lajitas. At one point, the road reaches a 15% incline and leads up to the Big Hill and Dom Rock. From there, a short scramble is required to reach the peak of a small mountain. At the top, views both east and west of the Rio Grande River put life in perspective if you are the contemplative type. Here, facing east towards Lajitas, the Rio Grande flows to the Gulf of Mexico. 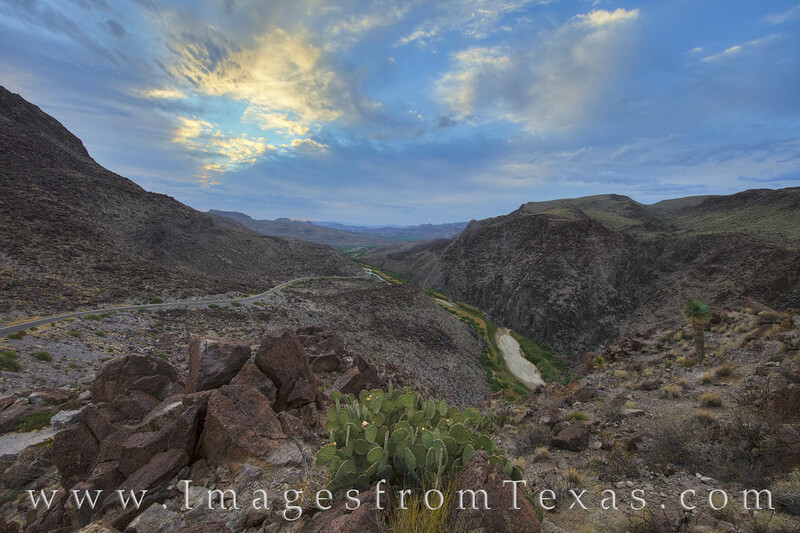 The lush greenery highlights the curves of the river and in contrast to the rugged rocky mountains that rise on both sides – Mexico on the south (right) and Texas on the north (left). This view from Dom Rock in BBRSP was taken on a cool Spring morning with amazing light.